I look over to a new hectic week. Tomorrow I’ll be leaving for a few days on a business trip, but I believe that I’ll be coming back home on Thursday. But only for a day and a post or two, because on Friday I hit the road again and go to my wife’s best friend wedding. So, until next Monday I’ll be mostly away from home. But don’t go too far, because as I said I think I’ll be able to make a post or two this week. 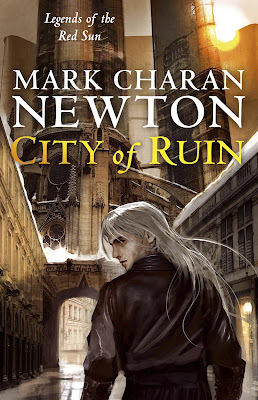 And to keep you company here is a very hot covert art, just taken from Mark Charan Newton’s blog, the artwork for his second novel in the “Legends of the Red Sun” series, “City of Ruin”. The artist of the cover artwork is Benjamin Carre, the same one who made the cover for “Nights of Villjamur”. Also if you head at Mark's blog you’ll find an attempt for the book blurb. I notice that you are reading Blood of Elves~ great book.... thoroughly enjoyed it. He is a master writer!